Over the course two hours, the debate ranged from the big picture of climate change and the energy mix to the specific details of driven grouse shooting, with biodiversity loss, natural capital, sustainable agriculture and the badger cull in between. You can now watch the whole debate online, or read a summary of the questions and answers courtesy of our event partners at CIEEM. But what were the most pertinent issues raised for our members? At the BES we have identified three ambitions for good policy-making over the term of the next Parliament: environmental policy informed by sound scientific evidence, recognising the vital role of ecological science in meeting societal challenges, and integrating the value of the environment to human wellbeing and prosperity across government. How did the panellists fare in addressing these crucial issues? Encouragingly, Lord de Mauley stated that “science and evidence are at the heart of all we do at Defra”, pointing to recent work on the Plant Biosecurity Strategy and Tree Health Management Plan as examples. However, on the controversial issue of the badger cull, Defra’s interpretation of the evidence was disputed, with Barry Gardiner, Eilidh Whiteford and Natalie Bennett all suggesting that scientific advice had been disregarded, a point echoed by audience member and BES member, and , part of the team that designed the Randomised Badger Culling Trial. While Lord de Mauley reiterated the Conservative’s position that culling should be part of a comprehensive strategy to tackle Bovine TB, Barry Gardiner was clear that culling would cease immediately under a Labour Government. The disputed interpretation of the evidence for the effectiveness of culling badgers to reduce Bovine TB – a politically charged topic–demonstrates the problems that can arise when science enters the world of policy, interacting with value judgements and political and economic priorities. Independent organisations such as the BES have a crucial role to play in providing unbiased scientific advice that can help inform decision-making, and we will continue to play close attention to ecological issues – such as the badger cull – where an objective assessment of the evidence is required. 2. Ecological Science is valued for the vital role it has to play in meeting some of the most important challenges of the 21st century. The debate covered a number of further issues where sound ecological science is vital to inform the development of effective policy. The panel were in broad agreement that halting and reversing biodiversity loss required a landscape scale approach – “bigger, better and more joined up” – as articulated by former BES President Professor Sir John Lawton and colleagues in the “Making Space for Nature” report. Both the Liberal Democrats and the Green Party committed to introducing new legislation – a Nature Act – if they were elected, although the other panellists were not drawn on this point. It is essential that any such legislation is based on the best possible ecological science. Meeting the challenge of sustainably feeding a rapidly growing population is another area where ecological science has an important role to play, and is one of our policy priorities. In this area, the debate discussion focused primarily on the potential role of genetically modified organisms (GMOs), with only Natalie Bennett maintaining clear opposition to their release in the environment, although not in principle to research into GM. Lord de Mauley was clear on the Government’s position, that any biotechnology deployed must be safe for humans and the environment , citing research by the European Food Safety Authority which concluded that GM meets this criterion. Barry Gardiner and Baroness Parminter indicated their willingness to consider the use of GMOs on the condition that appropriate safeguards were in place and evidence of their safety was clear. Eilidh Whiteford criticised GMOs as a ‘red herring’, raising the point that enough food is produced presently to feed the world’s population but that access to markets and huge amounts of food waste lead to observed levels of hunger. Ecological science has a vital role to play in ensuring that debates around GMOs are informed by sound evidence rather than simply politics and values, as a recent Science and Technology Committee report acknowledged is often the case. Furthermore, agro-ecology can offer broader solutions to the challenge of sustainable food production, from reducing carbon emissions to techniques integrating agricultural production and biodiversity conservation. 3. That the value of the environment to human wellbeing and prosperity – our natural capital – is recognised across government. The debate was a striking demonstration of the extent to which the language and framing of natural capital ­is becoming part of mainstream policy-making. Baroness Parminter argued that the Natural Capital Committee – whose recent third report outlined the basis for a 25-year strategy for nature’s recovery – should be placed on a permanent, statutory, footing, whilst Barry Gardiner stated that a Labour government would be committed to developing a parallel system of national natural capital accountsby 2020. Lord de Mauley made clear that he was “fundamentally convinced” that the “economy is completely dependent on the environment” and vice-versa. Through the Natural Capital Initiative, we will continue to work to ensure that the development of the natural capital approach is genuinely underpinned by sound ecological science. While natural capital may be becoming established as a mainstream way of thinking about our natural environment, the extent to which environmental concerns are integrated into decision making across government remains questionable. 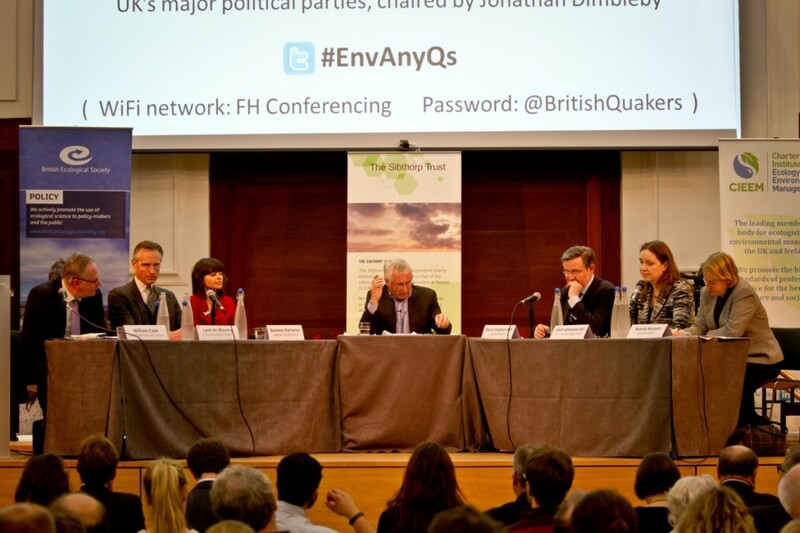 The question of whether or not government should continue to support fossil fuel extraction demonstrated these tensions, with the panel split on whether or not fracking should be pursued in the UK. In balancing the need to protect our natural capital and mitigate carbon emissions with the desire for energy security and the possibility of a slightly lower carbon fuel source, the panellists drew different conclusions. Lord de Mauley and William Cash were most supportive of fracking. Natalie Bennett commented that the UK Government has pursued a ‘fracking fantasy’, whilst Eilidh Whiteford stated that there should be a moratorium on fracking in England, as announced by the Scottish Government. Barry Gardiner was stated that a Labour Government would put a moratorium on fracking until ‘various conditions’ were met. Over the next few months, we will be fleshing out our priority policy issues for the next Government, underpinned by the three key principles outlined above. Regardless of who is elected, we will seek to ensure that Lord de Mauley’s promise to place evidence at the heart of Defra is adhered to. We will continue to promote the solutions and insights that ecological science can offer to pressing challenges from biodiversity conservation to food security, and will be developing case studies and resources demonstrating the impact of ecology. Finally, we will further develop the case for decision-making for the sustainable management of natural capital based on sound science. Our policy work depends on the support and expertise of our members and there will be numerous opportunities to engage over the coming months. Current opportunities include consultations on the Birds and Habitats Directives and the Nurse Review of the Research Councils to events on conservation conflicts and the science-policy interface. We are keen to hear from our members about their priority issues ahead of the general election, and case studies that can demonstrate the impact of ecology to policy-makers. Please get in touch with our policy team to find out more.